My first perfect landing! I spent half the day hassling with equipment. The carburetor needed to be adjusted for low altitude and the starter cord broke twice. The first time was when Bubba was giving me a start. He pulled the knot right through the handle and I felt every bit the newbie that I was. The second time I slipped a washer between the stopper knot and the handle and solved the problem. Eventually everything got put together and at 1:45 I laid out the wing and on my third attempt…finally, got into the air. The actual take-off was a lot easier than at 5500 ft ASL. I still had to run but not as far and not nearly as fast. The snap was taking longer than normal to come up to full power but sounded good when it got there. I noticed that the wing also climbed faster. Most of the other pilots were flying at 300 to 500 feet so I climbed to 1800 and tried to take it all in. For the first time in three months I was flying and it felt great! I could see the Fly-in below. There were lots of wings being laid out for take off and the rows of campers, trailers and tents between the take-off and landing zones. This was the first time I had been in the air with other pilots and watching the gliders from above was a nice change. I especially liked being the LZ and watching them land. The whole area looked like a development in its first stage. Apparently twenty years ago, somebody got the wise idea to turn the Salton Sea into a luxury retirement community. They built the infrastructure but they couldn’t sell the lots. I’m sure that if the water were good this would be prime real estate. Sea and desert surrounded by mountains. I can see it now, …millionaires and moviestars … Cigarette boats and beach bars. On second thought if the water had been good, we wouldn’t be here. So I guess toxic water can be a good thing. I would have stayed up longer but after 45 minutes I knew there wasn’t a whole lot of gas left. I decended into the flight pattern and did several “S” turns to bleed off altitude. The landing was great, a perfect two point touch-down. My altitude and forward speed reached zero at the same instant. What a feeling! I threw up my hands and shouted…YES… to the world. It was just what the doctor had ordered. After dozens of days of walking off the field without getting into the air and trips and falls and twisted knees and broken equipment…it was all worth it. No matter what happens from here forward, now…I am a pilot. I carried my rig back to the trailor in a kind of euphoric fog where several of the guys were hashing over their flights. Bo grinned at and said, “I saw your landing “. I chilled for about an hour and launched again. This time it was dead calm and my run was a lot longer and faster than I thought possible. At take-off, I took a bad step and felt my knee twist and I knew that I would either fly on the next step or fall on my face. If I’d had a little more experience I would have pulled some brake and popped myself right up, I was certainly moving fast enough, but what I think happened was that when my knee twisted I stumbled a little bit and that caused me to throw my arms forward tightening the brake lines. Whatever…I got into the air and that’s all that mattered. I was still having a hard time with the motor coming up to power slowly and it might have been part of the reason for the long run. There still wasn’t any breeze when I landed, so my glide slope was long and fast. I came in hot and remember thinking, “this is going to hurt”. I should have put one leg forward so that I could start running as soon as I touched down, but my knee was throbbing and I hadn’t put on the knee brace so I was afraid of dislocating it. I came in with both feet forward and hit the earth flat footed, most of my forward speed had dissipated, so I didn’t slide; it was a simple three point landing, feet…knees…face. I’d like to think that if my legs had been in the correct position I could have run it out.Nothing was hurt but it reminded me that I’m still a novice and have a long way to go. One of the great things about going to a fly-in is seeing the other equipment and meeting the manufacturers. For a variety of reasons powered paragliding is a cottage industry, with many of the paramotors being built in small shops around the world. I had a great time talking with Leon Wacker the owner of Paracruiser. Over the last several months he had been my only contact when I was having equipment trouble. More than once he talked me through a carburetor adjustment or how to balance the propeller. 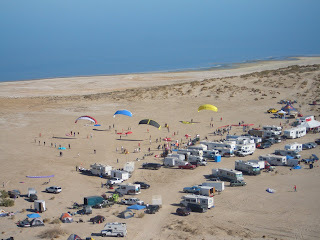 While I was there, we did a hang test with my paramotor and tweaked a few things to make it easer to get into the seat. I also met Wayne Mitchler and his wife Suzy, who weighs less than 100 pounds and was both, the inspiration and namesake for my machine. The Salton Sea lived up to its reputation for great flying conditions and even though I was content with two relatively short flights, other guys were literally flying all day. Fifteen-minute pit stops were not uncommon. Several times I saw pilots land, carry their gear out of the LZ, stop at their trailers to gas up, drink a soda, and… back into the sky. The last hour of daylight was magnificent. There were probably more gliders in the air at sunset than any other time. The full moon attracted the photographers and probably extended the flyable twilight. I think it was also because the guys had been sharing the sky all day and were now beginning to feel comfortable with others pilots around. Proof of that was it wasn’t uncommon to see groups of three or four flying in formation. Also it was the end of a day that nobody wanted to see end so we stretched the air time till we could just barely see to land. My first perfect landing! I spent half the day hassling with equipment. The carburetor needed to be adjusted for low altitude and the starter cord broke twice. The first time was when Bubba was giving me a start. He pulled the knot right through the handle and I felt every bit the newbie that I was. The second time it broke I slipped a washer between the stopper knot and the handle and solved the problem. Eventually everything got put together and at 1:45 I laid out the wing …and on my third attempt…finally…, got into the air. The actual take-off was a lot easier than at 5500 ft ASL. I still had to run but not as far and not nearly as fast. The snap was taking longer than normal to come up to full power but it sounded good once it got there. I noticed that the wing also climbed faster. Most of the other pilots were flying at 300 to 500 feet so I climbed to 1800 to get out of the traffic take in the sights. For the first time in three months I was flying and it felt great! I could see the whole Fly-in below me. There were lots of wings being laid out for take off and the rows of campers, trailers and tents between the take-off and landing zones. This was the first time I had been in the air with other pilots and watching the gliders from above was a nice change. I especially liked being over the LZ and watching them land. The whole area looked like a development in its first stage. The roads and water were in and there were a few scattered houses. Apparently twenty years ago, somebody got the wise idea to turn the Salton Sea into a luxury retirement community. They built the infrastructure but they couldn’t sell the lots. I’m sure that if the water were good this would be prime real estate. Sea and desert surrounded by mountains. I can see it now …millionaires and moviestars … Cigarette boats and beach bars. On second thought if the water had been good, we wouldn’t be here. So I guess toxic water can be a good thing. I would have stayed up longer but after 45 minutes I was afraid there wasn’t a whole lot of gas left. I descended into the flight pattern and did several “S” turns to bleed off altitude. The landing was great, a perfect two point touch-down. My altitude and forward speed reached zero at the same instant. What a feeling! I threw up my hands and shouted…YES… to the world. It was just what the doctor had ordered. After dozens of days of walking off the field without getting into the air and trips and falls and twisted knees and broken equipment…it was all worth it. No matter what happens from here forward, now…I am a pilot. I carried my rig back to the trailer in a kind of euphoric fog where several of the guys were hashing over their flights. Bo grinned at and said, “I saw your landing “. 6th FlightI chilled for about an hour and launched again. This time it was dead calm and my run was a lot longer and faster than I thought possible. At take-off, I took a bad step and felt my knee twist and I knew that I would either fly on the next step or fall on my face. If I’d had a little more experience I would have pulled some brake and popped myself right up, I was certainly moving fast enough, but what I think happened was that when my knee twisted I stumbled a little bit and that caused me to throw my arms forward tightening the brake lines. Whatever…I got into the air and that’s all that mattered. The last hour of daylight was magnificent. There were probably more gliders in the air at sunset than any other time. The full moon attracted the photographers and probably extended the flyable twilight. I think it was also because the guys had been sharing the sky all day and were now beginning to feel comfortable with others pilots around. Proof of that was it wasn’t uncommon to see groups of three or four flying in formation. Also it was the end of a day that nobody wanted to end, so we stretched the air time till we could just barely see to land. 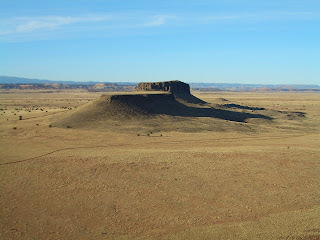 The Albuquerque site was on the top of a small ridge overlooking the high desert plain with a midsize Butte about 3 miles west. When we got there Brian and Bo immediately suited up and went for a flight. The terrain was very rocky with lots of scrub, but I’d seen how Brian was able to run around or jump most of the obstructions and I figured that if I was careful so could I. Wrong…After three attempts in the light air, I had only succeeded in twisting my knee and tangling my lines. Either I stumbled and dropped to one knee or failed to get a good inflation. Try as I might, I could not get enough forward speed for take-off. I knew that if I really torqued the knee, I would be grounded for the rest of the trip, so I decided to quit and save myself for an easier launch site. My knee seemed ok but it was starting to swell and I knew I would be limping in the morning. I put on the knee brace and hoped for the best. Doug also tried to launch but crashed his trike when he caught a line in a bush just as he started to rotate into the air. Luckily he wasn’t hurt, he did brake a prop, cut one of the glider’s lines and shattered his airbox. He was able to splice the broken line to get it flyable. The propeller wasn’t a problem because we all carried an extra prop but the airbox was totaled and his only hope was to find a replacement at the fly-in. While Doug and I were struggling on the ground Brian, John and Bo were exploring the territory and generally doing what every 12 year old boy dreams about. I’ll never forget Brian’s landing. He wanted to get in close but misjudged his approach and was about to crash into the trucks. Only by pulling some early brake and extreme athleticism at touch down was he able to pull off a two-point landing that flew him over one truck and dropped him between the two other vehicles. Of course he laughed off the whole thing but we both knew he had dodged a bullet. That night we sat in Brian’s pop up camper ate, drank and told hanger stories until it was time for bed. High altitude and clear skies made for a very cold sunrise. Since I wasn’t going to try another launch at this site, I decided to sleep in. When I finally crawled out of the sleeping bag and went outside I was treated to a great view of a really spectacular flight. John Sieb was making an aerial assault on the Butte. Because we had camped up high on the ridge, the terrain between us and the butte was several hundred feet down and John was flying close to the ground. You could see him weaving through the sparce trees on the plain below. Sometimes he would swing around a clump of trees other times he would pop over them. I watched with envy as he approached the Butte and climbed until he was able to circle the top. What a sport, able to navigate in three dimensions, without going swimming! He had been in the air for a couple of hours when he returned and you could tell from his demeanor, that it had been a special flight. Sometimes when a pilot lands he is so excited that he can barely contain himself often hooping and hollering is the norm. This time was a little different because John quietly gathered up his wing and packed his motor in the truck. When I asked him about it later, he looked off in the distance and just smiled. I guess you just had to be there. The drive from Albequere to Meteor City Arizona took us most of the day. Meteor City itself is nothing special, a trailer park and gas station with genuine imitation Indian handicrafts made in China. The crater is not part of the State or Federal Park system so we were not allowed to approach unless we wanted to join a tour and follow their guides around. We had arrived in plenty of time for a flight so John and Brian took off and explored the area. Doug’s motor was out of commission and my knee had stiffened up so we had to content ourselves with watching and wishing. The crater is a couple of miles south of the highway, from a distance it looks like a ridge, once again nothing special. I do want to come back here and try again because the pictures John brought back were pretty cool and there is a ruin on the way out that I would like to investigate. John misjudged his fuel landing short and out of gas. I was impressed though because he recognized the problem early and while he was still out by the crater climbed to a high enough altitude that he was able to glide most of the way back toward the LZ. It was blowing pretty hard the next morning so we didn’t waste anytime getting on the road. ___hours later we were on the final leg, approaching the Salton Sea when Doug’s truck broke down. We called for a tow and left Doug at the truck while the rest of us jumped into Brian’s rig and drove the last couple of miles to the Fly-in. I saw the gliders off in the distance, there were dozens of them in the air, all going nowhere slowly. Once we had checked in a couple of the guys carried their machines down to the beach and took off. I was limping pretty badly and opted to rest my knee until the next morning. That night Brian introduced me around and wandered up to the “clubhouse” where I met Tim Russman who is the photographer/ videographer emeritus for Powered Paragliding. We chatted while he prepared his equipment for the next day. I also met Bob Peters, (a.k.a. Bubba), who had come out with his wife and a large group from the Pikes Peak PPG Club. I declined to join their sing-a-along but stayed around to enjoy the music. It was early to bed and early to rise because I was determined that the next day I would be flying! I’m told the Salton Sea is the largest inland body of water in California. It’s certainly one of the most toxic. They say it will eat the gel coat off a boat hull in a week and I believe it. Not good for boating or fishing, no seaside sunbathers or palatial summer homes. There is only one thing the Salton Sea is good for and that’s …Flying. Smooth laminar off shore breezes make it one of the premiere PPG sites in America and every February, pilots from all over the world come together to attend the Paratoys Fly-In. With four flights under my belt I figured I was ready and joined up with Brian, Doug and John Sieb to convoy down for the “Big Fly-in”. I was excited to meet all the guys I’d been listening to on the Internet podcasts and looking forward to the easy takeoffs we would have in the thick air two hundred feet below sea level. The plan was to drive to Albuquerque, fly that evening, campout and fly again in the morning. Then go southwest to the meteor crater in Arizona and fly it the second night. 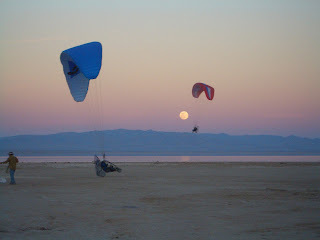 The next day we would push on to the Salton Sea hoping to get there in time for an evening flight. Somewhere by Pueblo we hooked up with Ranger Bo. Ranger Bo is a hoot. Six-foot plus with a perpetual grin. He wears a ‘ZZ Top’ styled beard has unruly long hair and wild man eyes. Bo radiates good will, he is the kind of guy that the first minute you meet, you just know, here is guy who will give you the shirt off his back and be a friend for life. Bo had hung up his spurs after twenty years as an army paratrooper and later as a member of the elite group called rangers. He moved to Colorado with his German bride and was planning to live the rest of his life spending his pension and enjoying himself. I liked the guy immediately. Bo flew the Airfer which was a beautiful paramotor with lots of chrome and anodized blue aluminum and he kept it clean and polished just as you expect an ex-ranger to do. He was the first pilot I’d met with a logoed wing, his said,’ RANGER BO’, in big block letters across the bottom. Gotta love it! Doug also tried to launch but crashed his trike when he caught a line in a bush just as he started to lift off. Luckily he wasn’t hurt but; he did break a prop, cut one of the glider’s lines and shattered his airbox. He was able to splice the broken line with some scrap Bo had and get the wing flyable. The propeller wasn’t a problem because we all carried an extra prop but the airbox was totaled and his only hope was to find a replacement at the fly-in. While Doug and I were struggling on the ground Brian, John and Bo were exploring the territory and generally doing what every 12 year old boy dreams about. I’ll never forget Brian’s landing. He wanted to get in close but misjudged his approach and was about to crash into the trucks. Only by pulling some early brake and extreme athleticism at touch down was he able to pull off a two-point landing that flew him over one truck and dropped him between the two other vehicles. Of course he laughed off the whole thing but we both knew he had dodged a bullet. That night we sat in Brian’s pop up camper ate, drank and told hanger stories until it was time for bed. High altitude and clear skies made for a very cold sunrise. Since I wasn’t going to try another launch at this site, I decided to sleep in. When I finally crawled out of the sleeping bag and went outside I was treated to a great view of a really spectacular flight. John Sieb was making an aerial assault on the Butte. Because we had camped up high on the ridge, the terrain between us and the butte was several hundred feet down and John was flying close to the ground. You could see him weaving through the sparse trees on the plain below. Sometimes he would swing around a clump of trees other times he would pop over them. I watched with envy as he approached the Butte and climbed until he was able to circle the top. What a sport, able to navigate in three dimensions, without going swimming! He had been in the air for a couple of hours when he returned and you could tell from his demeanor, that it had been a special flight. Sometimes when a pilot lands he is so excited that he can barely contain himself, often hooping and hollering is the norm. This time was a little different because John quietly gathered up his wing and packed his motor in the truck. When I asked him about it later, he looked off in the distance and just smiled. I guess you just had to be there. The drive from Albuquerque to Meteor City Arizona took us most of the day. Meteor City itself is nothing special, a trailer park and gas station with genuine imitation Indian handicrafts made in China. The crater is not part of the State or Federal Park system so we were not allowed to approach unless we wanted to join a tour and follow their guides around. We had arrived in plenty of time for a flight so John and Brian took off and explored the area. Doug’s motor was out of commission and my knee had stiffened up so we had to content ourselves with watching and wishing. The crater is a couple of miles south of the highway, from a distance it looks like a ridge, once again nothing special. I do want to come back here and try again because the pictures John brought back were pretty cool and there is a ruin on the way out that I would like to investigate. John misjudged his fuel landing short and out of gas. I was impressed though because he recognized the problem early and while he was still out by the crater climbed to a high enough altitude that he was able to glide most of the way back toward the LZ. It was blowing pretty hard the next morning so we didn’t waste anytime getting on the road. Several hours later we were on the final leg, approaching the Salton Sea when for no obvious reason, Doug’s truck broke down. We called for a tow and left Doug at the truck to wait, while the rest of us jumped into Brian’s rig and drove the last couple of miles to the Fly-in. I saw the gliders off in the distance, there were dozens of them in the air, all going nowhere slowly. As soon as we had checked in, John and Brian carried their machines down to the beach and took off. I was limping pretty badly and opted to rest my knee until the next morning. That night Brian introduced me around and I wandered up to the “clubhouse” where I met Tim Russman, the photographer/videographer emeritus for Powered Paragliding. Tim is responsible for ninety percent of the PPG movies available. I had seen just about everything he had done so we had plenty to talk about. I also met Bob Peters, (a.k.a. Bubba), who had come out with his wife and a large group from the Pikes Peak PPG Club. I declined to join their sing-a-along but stayed around to enjoy the music. It was early to bed and early to rise because I was determined that the next day I would be flying! We got to the field about 9:30am and watched Brian assemble his trike because he was having trouble with the electric starter on regular motor. Once it was all together he launched and came right back down due to turbulence. I had purchased a small canister of helium from Sam’s Club so we launched a pilot balloon and watched it duck and weave all the way up to 500 feet where it caught a northerly current which quickly pushed it out of sight. Doug and Brian had business in Fort Collins, so I was left at the field with Barton George to wait for the afternoon flight. Barton had driven up from Colorado Springs where he was a pathologist at Fort Carson Army Base. Like me, he was a new pilot and full of enthusiasm. So full of enthusiasm, that he could not stop talking about it. He showed me the devise he had invented to balance his propeller and copies of articles that he had printed off the internet. Nice guy, but the nonstop hanger stories from a pilot with less than five flights was starting to get on my nerves. Eventually I decided it would be a good time to work on the carburetor. Big mistake, when I tried to fire up the motor, the pull cord broke. There was nothing to do but take off the starter and repair it. I’m always intimidated by machinery the first time around but nobody was going to fix it for me, so I undid the harness and dove in. Expecting it to explode into a cloud of parts and springs like the first time I’d opened an old camera, I was delighted to find it was a relatively simple mechanism. I did put the Pawls in backwards and had to redo it, but other than that little goof, it was back together and ready to fly when Brian and Doug returned. Barton was the only one to fly that afternoon. I remember his landing because he came down within five feet of the truck and the way he flared caused the wing to turn slightly causing him to do little dance on touch down. To his credit he stayed on his feet. When it was my turn I just couldn’t get up. The first time the wing came up crooked and I aborted. The second time I stumbled and went to my knees with the wing collapsing on top of me. The third time the motor died when I started to run so I packed up and drove home frustrated.